Mageia is a Linux distribution forked from Mandriva Desktop. 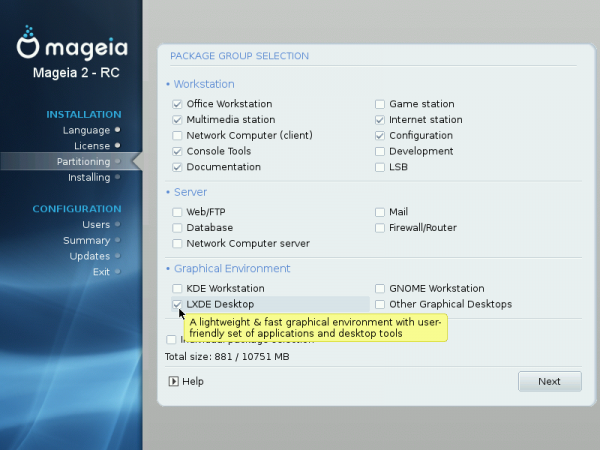 Mageia 2 is the upcoming release, which is slated to be made available for public download just four days from today. I have been messing around with the Release Candidate, whose installation image comes in a CD- or DVD-size ISO image. 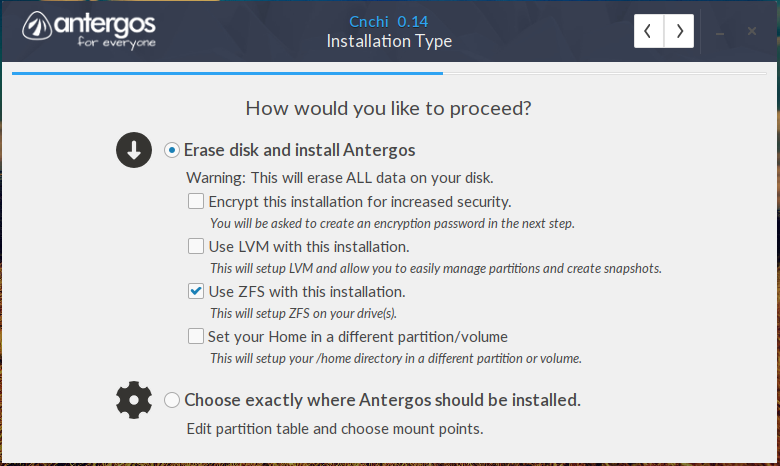 During the installation process, I observed that you are given the option to select what desktop environment to install, whether the installation is from a CD or DVD image. That is not how it used to be with this installer. But this new look is a good thing. If using a CD-sized installation image, the step after disk partitioning should look just like this. And if using a DVD-sized installation image, it should first look like this. Then like this, if you select the Custom option from the previous step. 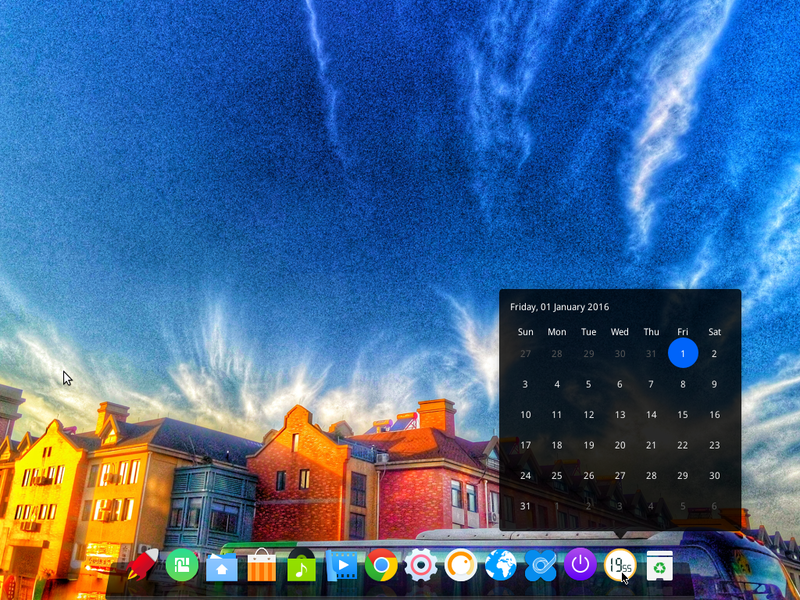 Regarding the GNOME 3 desktop, I was hoping that the developers will at least make an attempt to customize the default desktop in a manner that makes it more user-friendly, just like that of Linux Deepin or Comice OS. 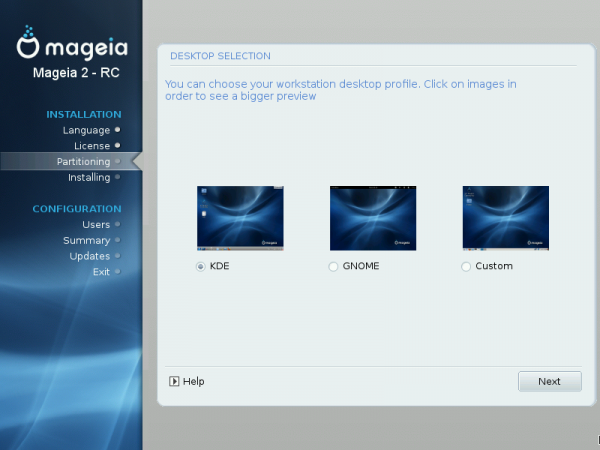 But that is not what you will see if you install a Mageia 2 GNOME 3 desktop. Rather, you get the familiar but so user-unfriendly default GNOME 3 desktop. At least the wallpaper looks cool. And then, of course, you have the activities view. Given that final release is right around the corner, I do not think there will be any meaningful changes – if any – to the default desktop, but I hope that the developers do something about it by the next release. 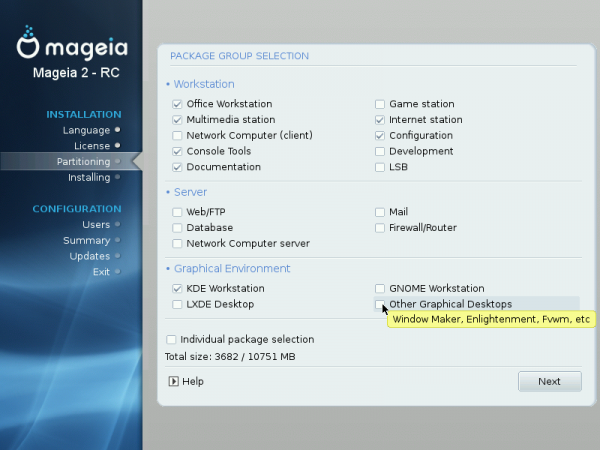 I didnt know that Mageia2 came with GNOME by default. I always thought that because Mandriva and its sort of offshoot PCLinuxOS where always among the best KDE distros, that Mageia would be too. I guess the survival of Mandriva is still needed after all. Sidebar: I just checked the Mageia wiki page andit was deleted on the 13th. Still not back up. Actually, going by the screenshots, you have your choice of KDE, GNOME, or LXDE at installation time. Undfortunately, all of those options have drawbacks for me if the GNOME version is GNOME 3. 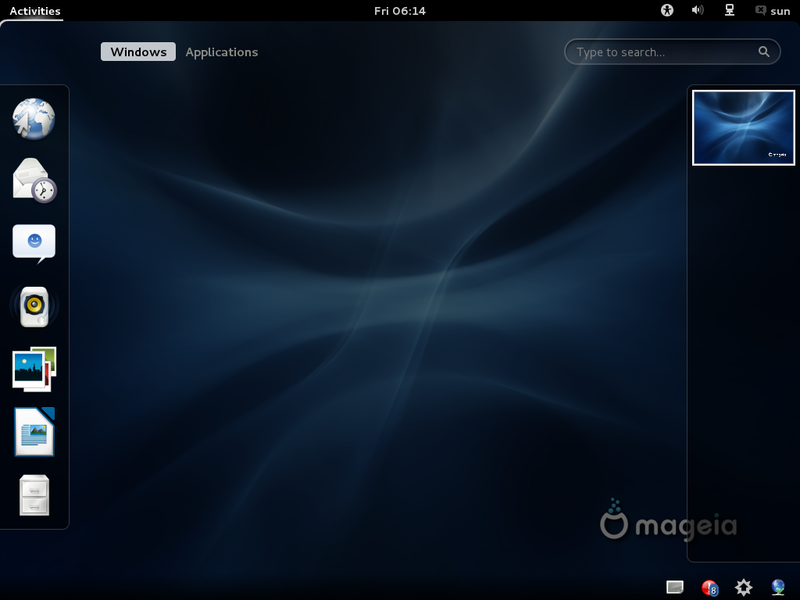 Mageia 2 does not come with Gnome as default. 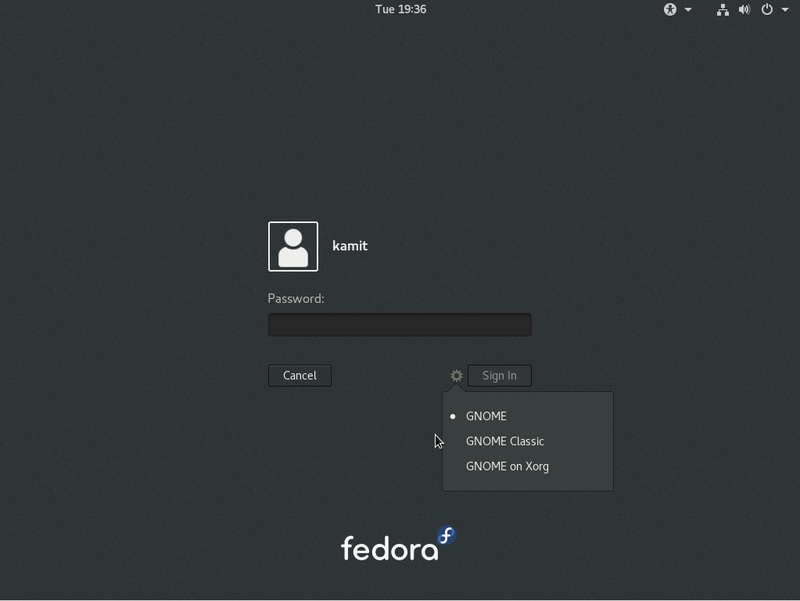 Gnome is one of the options to be selected when instsalling the system. KDE is default. I think the title is being misread. It not suggesting that GNOME 3 is the default DE. The “default” refers to the stock configuration of the GNOME 3 interface, which is how GNOME 3 ships in Mageia 2, at least in the RC release. Honestly, thats EXACTLY how I read it!! I thuoght it was my english the problem because I was sure KDE was the default desktop. Glad to know its not just me. And I checked the Wikipedia page and its sort of right. The french and spanish Wikipedia have a page for Mageia. The english page was deleted by this Seraphimblade person who probably has a bit too much time. So NO MAGEIA WIKIPEDIA page in english!!! 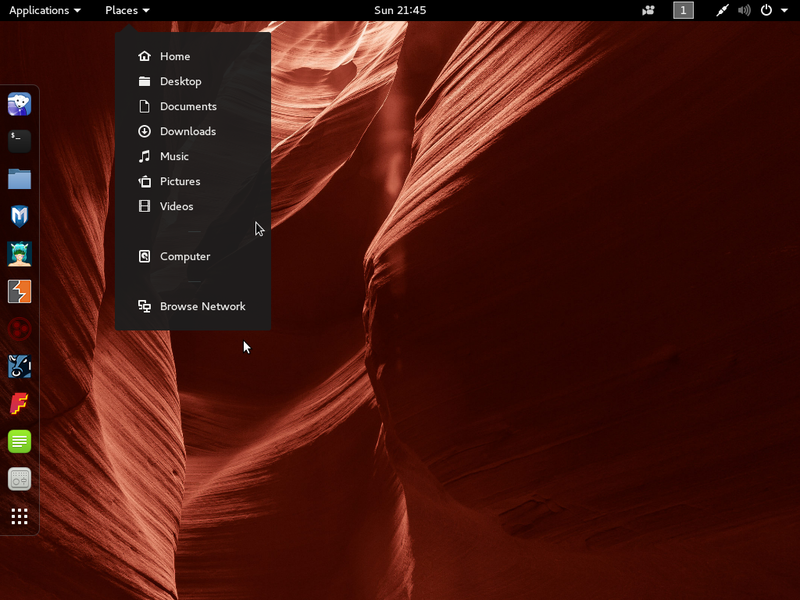 Why should it be a distribution’s responsibility to make Gnome 3 a better desktop? Is that not the job of the Gnome project? Seems to me that this article is complaining about development which is far beyond the scope of the Magiea distribution. Gnome should put out the better desktop, not each separate distribution. You guys have not given gnome-shell a decent go. I have been using Linux full-time for 15+ years and I was initially a little frustrated by gnome-shell also (and more so Unity for that matter). But after using gnome-shell now for 6+ months I have grown to love it. Don’t corrupt gnome-shell with any of those silly extensions which attempt to recreate gnome 2. I also like Unity but it is still buggy, even in 12.04 LTS. Both gnome-shell and Unity are better and more productive environments than gnome 2 or kde. Glad you liked GNOME-Shell more than Unity. But at least in Unity, you still have the traditional controls of a window, while the Shell wants all of us to be forced as task-oriented “ALL THE TIME”. I just want to decide myself of when I am going to focus on a certain Window/task. GNOME Shell attempted to control users by removing and disabling almost everything. I agree. It took me a little while to get used to it, but I now love Gnome 3. You just need to customize it a little with the extensions, which are very easy to set up. I never liked Gnome 2, but I love Gnome 3. Bah. I’m afraid I have given it a decent go. 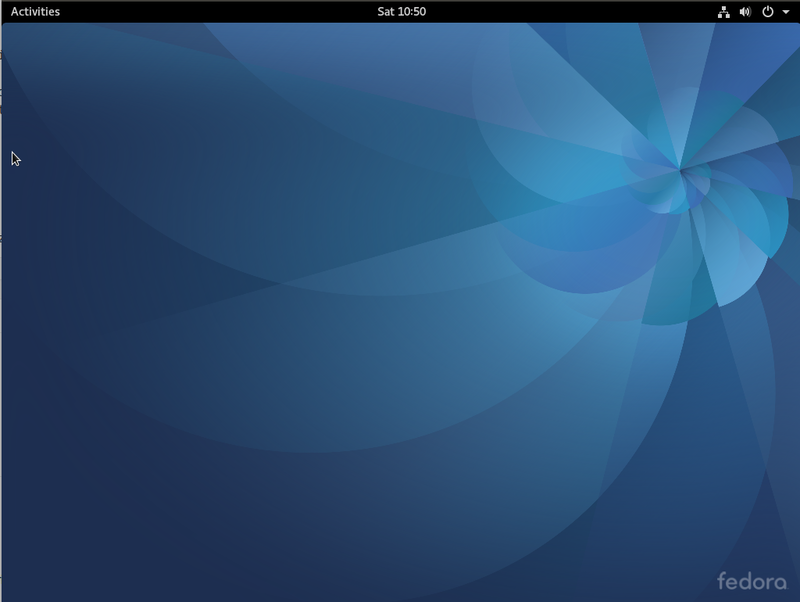 I liked Gnome 2 and am at best tepid about KDE. Still, would have gone for KDE over Gnome 3, but on my machine KDE had some odd hiccups I couldn’t live with so I had to go with Gnome 3 while I cast around for alternatives both I and my family could handle. Took a while, but Gnome 3 just didn’t let me do what I wanted. Launching programs was annoying, switching was annoying, the tendency for an incautious mouse move to toss me into the program-switching view was annoying. Everything took more actions to make happen than under Gnome 2. I’ve never understood why “It takes more steps to accomplish things” is supposed to be a matter of taste or not giving something a chance. Bottom line: With launchers on a toolbar, I click once and it happens. With the windows already lined up on another toolbar, I click once and I’ve switched programs. I don’t have to bring up a view and then find what I want and then click, I just do one thing. Gnome 3 won’t let me do that. In the end I’ve been driven to Mint, which is disappointing because I’ve always liked the Mandriva control centre, but Mint gives me Cinnamon instead of flippin’ Gnome 3 and I’m not looking back. Cinnamon, like Gnome 2, doesn’t get in my way. I find gnome shell very user friendly. I am lost now if I switch to a set-up that does not have the shell active. I absolutely love it, so much more so than unity. I can’t understand what this fixation is with “user-unfriendly” desktops. Sure, there is a place to try out these desktops, but that doesn’t mean you have to go against the grain and discard user-friendly desktops. How does anyone expect to attract customers if they ignore the customers wishes? .. because the Linux Philosophies are many and entrenched in positive and negative exremist viewpoints. From a corporate addoption standpoint, conformiy, and stability are required…. thus desktop choice is bad, it means more and needless support for the I.T. staff. From an end user, either home or professional who maintains their own system, choice is good, it enables them to pick. To answer your question, you can’t bow down to all the users wishes because often there are as many wishes as there are users, and not enough resources or options to provide said wishes. Then if they did, what type of catastrophy OS would be the result? A project needs a simple goal that can accomodate and manageably support as many people as possible. However, in terms of attracting a wider audience as possible, I believe that a project should allow for intellignet customisation, to that end – eg: Document how to transform the default and hideous gnome 3 shell environment into something useable by the many of us who have used computers since before the advent of GUI’s, and through the many standards based and intuitive GUI’s we’ve used for decades. I’m not opposed to change, and eye candy, but. 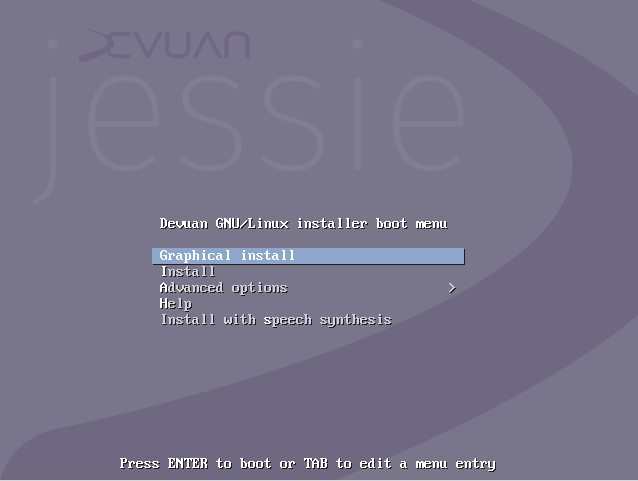 we need to be able to configure any Graphical shell to individual tastes with a control panel… you know – like we’ve had for a decade – hint hint… and not like the hidden mystery and complete failure that is gnome-tweak-tool. Therefore if a graphical environment doesn’t have these options as a shipping default; It’s incomplete and not deserving of a 1.0 designation. This includes and applies to cinnamon (flaky), gnome-shell (repugnant without 10-15 extensions, themes and some hacking – but my daily shell), mate, xfce, lxde. They’re all flawed. Gnome 2.x was to a degree, but also mature. Gnome 3 Should never have been part of any distribution, and should not have a current 3.4 version number, it’s still beta – IMO, and certainly not RC worthy. The theme is designed for the blind and tasteless, ignores technical / academic artistic types – geez, hire an artist! There’s some excellent people who could use a cheque on deviant art :p – hire them to design — get this…. Complete UI Alternative themes that don’t meke people hurl and leave in droves. So yeah, I steered away a little lol… but hm… what we need is something that needs very little in terms of customization, and is pretty to all. While I’m no fan of Windows, cudos for an attractive and usable interface that catrs to virtually all users, isn’t ‘broken’. and for the die-hard cpu-cycle extremists can be reverted easily to something that looks like windows 2000, but importantly functions the same with easy intuitive options to do so. It’s about workflow and convenience. A very structered and concise answer. 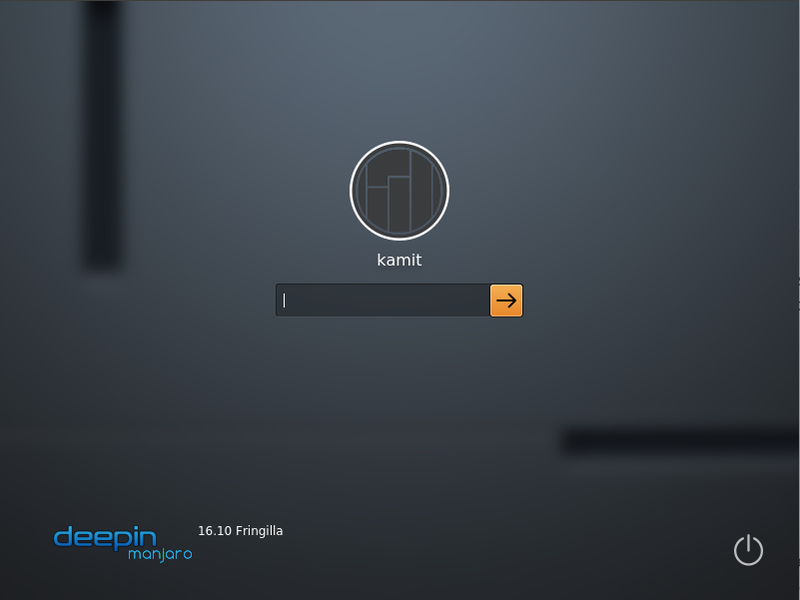 I am currently using KDE,which i like very much, but i always like to try other alternatives. One of the reasons that kept me away from gnome-shell were all the criticism around its, mostly, tablet-y interface. Your view points intrigue me… as a person that says, correctly by my perspective, “what we need is something that needs very little in terms of customization, and is pretty to all” chose such a DE even though you needed to install so many extensions. Don’t get me wrong, i’m not judging you, only trying to understand such decision, when, by your answer, it seems that KDE may be just what you need in your desktop. Did gnome-shell shaped to what you wanted? Is there that frustrates you or you think there is a show-stopper feature that keeps it for being a real desktop alternative? Those horribly greyish colors that are virtually present in GNOME Shell 3, is very ugly. Yes, beauty is in the eye of the beholder, but there are some things that almost everyone will agree as “beautiful” and some things that everyone will agree as “horrible”. That is a fact. And GNOME Shell’s designs falls down on that horrible category. Windows XP’s GUI is much better than what we have in GNOME Shell.